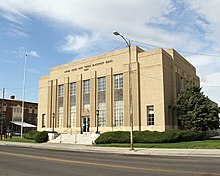 United States Post Office in Blackfoot, Idaho. Bingham County comprises the Blackfoot, ID Micropolitan Statistical Area, which is included in the Idaho Falls- Rexburg-Blackfoot, ID Combined Statistical Area. According to the US Census Bureau, the county has a total area of 2,120 square miles (5,500 km2), of which 2,094 square miles (5,420 km2) is land and 26 square miles (67 km2) (1.2%) is water. The Snake River flows southwest through the middle of Bingham County; at the county's southwest corner the river flows into the American Falls Reservoir. At the SE county corner is the Blackfoot Reservoir and Dam, impounding waters of the Blackfoot River. Outflow from the Blackfoot Dam flows northwesterly through the lower part of Bingham County, discharging into the Snake River. Smaller buttes called the East Butte and the Middle Butte located in the Snake River Plain are visible south of US Route 20. As of the 2000 United States Census,  there were 41,735 people, 13,317 households, and 10,706 families in the county. The population density was 20 people per square mile (8/km²). There were 14,303 housing units at an average density of 7 per square mile (3/km²). The racial makeup of the county was 82.43% White, 0.17% Black or African American, 6.70% Native American, 0.57% Asian, 0.03% Pacific Islander, 7.95% from other races, and 2.14% from two or more races. 13.30% of the population were Hispanic or Latino of any race. 23.6% were of English, 12.5% American, 8.9% German and 5.1% Danish ancestry. There were 13,317 households out of which 44.60% had children under the age of 18 living with them, 66.70% were married couples living together, 9.80% had a female householder with no husband present, and 19.60% were non-families. 17.10% of all households were made up of individuals and 7.70% had someone living alone who was 65 years of age or older. The average household size was 3.10 and the average family size was 3.52. The county population contained 34.90% under the age of 18, 9.70% from 18 to 24, 25.30% from 25 to 44, 19.70% from 45 to 64, and 10.30% who were 65 years of age or older. The median age was 30 years. For every 100 females there were 100.00 males. For every 100 females age 18 and over, there were 97.90 males. The median income for a household in the county was $36,423, and the median income for a family was $40,312. Males had a median income of $31,950 versus $21,591 for females. The per capita income for the county was $14,365. About 9.90% of families and 12.40% of the population were below the poverty line, including 16.30% of those under age 18 and 7.20% of those age 65 or over. Bingham County voters are reliably Republican. In no national election since 1948 has the county selected the Democratic Party candidate.